If South Korea needed to “build its core military capabilities” in 2014, then presumably the SK generals were not as good as the US generals. They must have improved a lot in 3 years, because now they want to take over from US generals in war time, which would make North Korea “fear us more” – more than they fear being “totally destroyed” by Trump. That obviously doesn’t stack up, so what is really going on here? I suspect that this is an attempt to rein in US control as they are too gung-ho about a war on the Korean peninsular, and making further provocations that could spiral into that war. This is a weakening of South Korea-US relations. This is echoed by the second article below, that says 61% of US citizens polled think that diplomacy would work better than threats – a point made repeatedly by Russia and China. “North Korea will fear us more and the people will have more faith in our military when we have wartime operational control of our military. The transfer of the wartime operational control based on our strong defense capabilities will lead to a great development of our military’s structure and capabilities,”said Moon during a speech to mark the 69th Korean Armed Forces Day at a navy base in Pyeongtaek, south of Seoul. Between 1950, when General Douglas McArthur took charge of the South Korean army, and 1994, a US general served as its commander. Since then, Seoul has taken back peacetime control of its armed forces, but would delegate command to the US in case of a conflict, though Korean politicians do formally have a veto. Moon, elected in May this year, now believes that South Korea has to be more proactive in strengthening its army, in the wake of a series of missile and nuclear tests by the North. Over two-thirds of US voters find President Donald Trump’s remarks on North Korea unhelpful in getting Pyongyang to stop its nuclear weapons program, according to a Fox News opinion poll. Only 23 percent of Americans said otherwise, the survey found. 61 percent of the respondents said they see diplomacy as the best way to halt North Korea’s weapons programs, while 27 percent said that threatening military action is Trump’s best bet. Overall, voter disapproval of the US president’s handling of North Korea is on the rise, from 45 percent in July to 50 percent in August and 55 percent in September, according to the poll. Trump and the North Korean leadership have exchanged numerous threats recently, as the North continued its testing of ballistic missiles, including one of a reported hydrogen bomb. The White House later denied that the US had declared war on North Korea. At the UN General Assembly last week, Trump threatened to “totally destroy” the North, if it attacked the US or its allies. Pyongyang responded with more threats. Two permanent members of the UN Security Council – Russia and China – insist on the US dialing down belligerent rhetoric toward the North and pursuing negotiations. 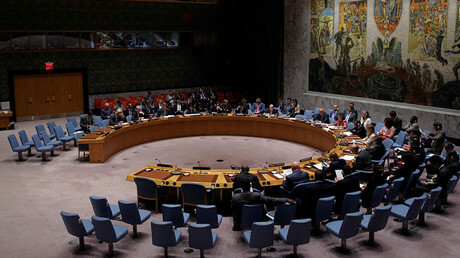 In the last few months, the UN Security Council passed resolutions for a series of biting economic sanctions against the North following its repeated testing of ballistic missiles. The UN sanctions targeted shipments of oil and other fuel used in missile testing, as well as the assets of the government and its leaders. The most recent UN resolution also banned all textile exports from the North and prohibited any country from authorizing new work permits for North Korean workers – two key sources of hard currency for the country. “This resolution also provides for political measures that must also be carried out. This is why we called upon our American and other partners to fulfill political and diplomatic solutions, which are stipulated in the resolution,” Russian ambassador to the UN Vassily Nebenzia said following the adoption of the UN’s latest measures earlier in September. Last week, Russian Foreign Minister Sergey Lavrov condemned both the reckless tests of Pyongyang and aggressive rhetoric of the US, urging all parties to stick to a diplomatic approach to resolve the Korean Peninsula crisis. “We have to calm down the hotheads and understand that we need pauses, we need contacts,” Lavrov said, speaking to reporters on the sidelines of the UN General Assembly in New York.